Honor the Life, Memory, and Contributions of Richard L. Hurlbut and James D. Walker. Introduce and Engage the public with the Sumner Museum Collection. Promote the work and valued research of individuals who have used the Sumner Archives as one of their major resources for a finished work; i.e. book, dissertation, film, community project, etc. 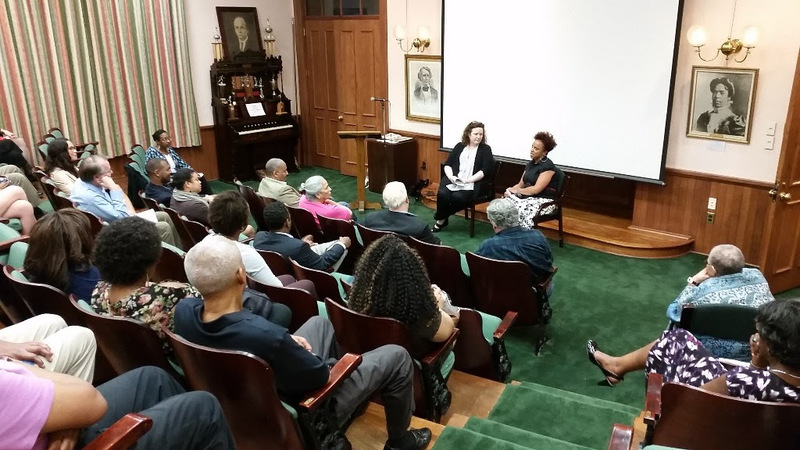 Facilitate lively discussion about the culture, history, and legacy of DC Public Education. The summer forum will occur on the third Wednesday of each month, June-August from 6:30 – 9:00 PM. The forum is free and open to the public. If you are interested in being a featured speaker, please submit a summary of what you would like to present in under 200 words. Be specific when referencing the completed work or if the work is in-progress. This includes, but is not limited to book, film, dissertation, thesis, community project, oral history project, etc. Your selected presentation must include significant use of the Sumner Museum Collection as a resource. All submissions must include your name, mailing address, e-mail address, and professional/organizational affiliation. Please note which of the 3 dates you are available to present in order of preference. For consideration, please e-mail your submission by C.O.B. April 30, 2019 to info.sumnerschool@dc.gov. Submissions will be reviewed within the week of May 1st and notifications will be sent out by May 15, 2019. We look forward to another outstanding series! Dr. Frederick Douglass and the Douglass Family were steadfast supporters and advocates for the entirety of the school system from its teachers to its students to its administrators to its philanthropic benefactors to its supporters in the US House and US Senate. Dr. Douglass, a former night school teacher in Baltimore, lectured to support night schools in Washington City. Charles Douglass, the youngest Douglass son, was a night school teacher in Old Barry Farm. Virginia Douglass, wife of Frederick Douglass, Jr., served as a principal in Old Anacostia. The Douglassess supported DC Public Schools and were thusly integral in elevating DCPS in its importance both locally and nationally to the educational and social uplifting of African-Americans. The first African-American graduate of Harvard, the first four African-American women to obtain a doctorate and Carter G. Woodson are just some of those who either attended or educated within the DC Public School System. Haley George Douglass, the Harvard-educated grandson of Dr. Douglass, taught at Dunbar Senior High School for four decades. We extend our sincerest appreciation for the work of Director Kimberly Springle of the Charles Sumner School Museum and Archives and for the opportunity to present on a topic of great personal interest. On the backroads of Sandy Spring are families and tribes who family lore tells of ancestors being taught be Emily Edmonson Johnson, a friend of Dr. Douglass and teacher at Miner Normal School. I attended school with the descendants of those taught by Mrs. E. Edmonson Johnson so therefore it is my obligation to uplift the fallen and lost history. The summer forum will occur on the third Wednesday of each month, June-August from 6:30-9:00pm. The forum is free and open to the public. For consideration, please e-mail your submission by C.O.B. April 30, 2019 to info.sumnerschool@dc.gov. Submissions will be reviewed within the week of May 1st and notifications will be sent out by May 15, 2019. Join us at Charles Sumner School Museum and Archives and help to improve and create Wikipedia articles about the history of public education in the District of Columbia. No Wikipedia editing experience is necessary, as training will be provided. Reference materials from the Sumner Archives will be readily available. This event is free and open to the public. Registration is required. Lunch will be provided. Laptops are required. Please bring your own.